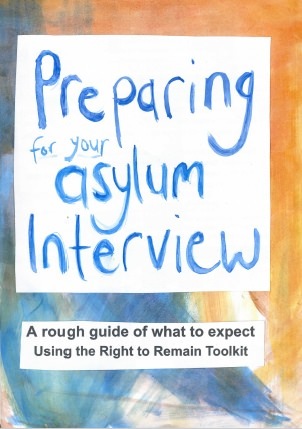 New on the Right to Remain website last week is a useful and unusual illustrated rough guide to preparing for an asylum interview. "It's beautiful and incredibly important," Right to Remain said. The guide is an online version of a fanzine-format magazine published by the Early Asylum Project in Sheffield and you can download it here (it's a 17MB file) or read it online here. Across 28 pages, the guide covers the basics of asylum and introduces some of the terminology that will be encountered when claiming asylum before focusing on the main subject of how to prepare for the substantive interview. The rough guide features information from the Right to Remain Toolkit, in particular the section on the asylum interview. It provides information on what to expect at an interview, a list of example questions that might be asked, and tips and good practice for preparing. Right to Remain says the interview can be the most important part of an asylum application. The Right to Remain Toolkit states: "You are going to be asked questions about things that may be very difficult to talk about. Be prepared for not being believed. It is common for the Home Office interviewer to explicitly say they do not believe you. "You need to be very clear, give as much detail as possible, and try to remember to include all the important information. "Have friends, neighbours and supporters on hand to talk to before and after the interview."